It has been a little over two weeks since the first Avengers: Endgame trailer dropped out of nowhere on the morning of Friday, December 7. The first trailer didn’t give too much away aside from the actual name of the movie, a reveal Marvel fans have been debating ever since Avengers: Infinity War ended (it still feels weird to call it Avengers: Endgame instead of Avengers 4). However, the lack of plot didn’t stop Marvel fans from pouring over every frame a million times over for clues. If you want to go into Avengers: Endgame cold in April, here’s your chance to look away. As for the rest of us, debating about which theory will come true is half the fun of being a super Marvel nerd. 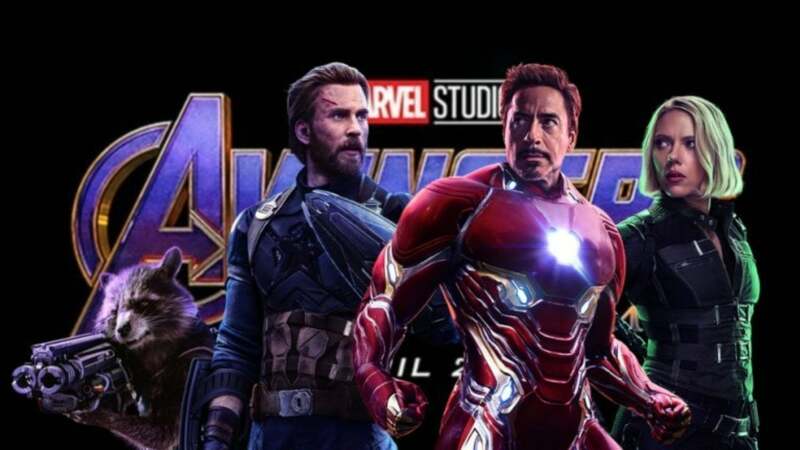 Without further ado, here are the top three Avengers: Endgame theories that still make sense after the first trailer. The theory: Everyone who got dusted after Thanos’ snap didn’t actually die but was transported to another dimension or alternate universe via the Soul Stone. What it means: This theory comes directly from the comics where inhabitants live out their lives as prisoners of the Soul Stone (which is sentient). This theory does have some ground as we have seen the inside of the Soul Stone in Infinity War. 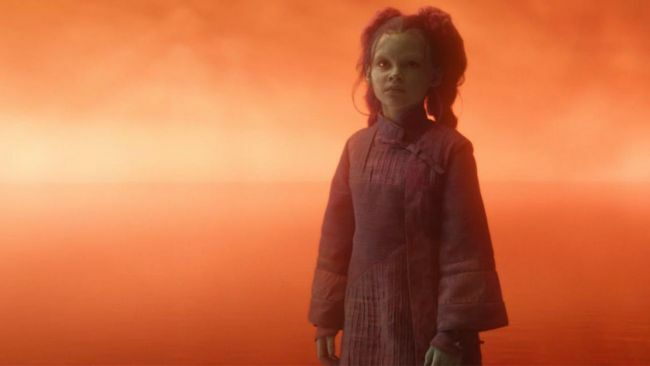 After Thanos snaps his fingers and achieves his lifelong mission, he is transported to an orangey world (the exact shade of orange as the Soul Stone) where he talks to a young Gamora. The possibility that the dusted characters didn’t actually die means that Marvel could include some of the popular characters who were snapped like Black Panther and Spider-Man in Avengers: Endgame. By including popular characters in Endgame, Marvel could draw in a wider audience who doesn’t care that much for the heroes that survived the snap. Why it works: Russo Brothers confirmed that this scene was inside the Soul Stone during a Q&A saying, “Yeah it’s implied [that] it’s the Soul Stone. It’s all orange around, then he’s inside the Soul Stone with the amount of power that it took to snap his fingers – he has this out of body experience with Thanos.” He went on to confirm that Gamora is still alive: “She, in fact, is [alive], yes.” We also know that Marvel Studios has future plans for some of the characters that were dusted, so they are going to have to come back in one way or another. We know Marvel is not going to kill Black Panther any time soon, considering it made over $1 billion at the box office. The Spider-Man: Homecoming sequel is set to be released in July 2019 and has been confirmed by both Kevin Feige and Amy Pascal to be set after Avengers: Infinity War. Additionally, it was announced recently that Scott Derrickson will return to direct the sequel to Doctor Strange. However, Spider-Man, Black Panther, and Doctor Strange are characters who “died” in Infinity War. How could they have sequels if they are dead? The Soul Stone Theory that suggests that the characters who got snapped are alive, simply trapped. This allows Marvel to bypass the common criticism that deaths don’t mean anything in the MCU. If this theory is correct, it means that everyone who died in the snap could come back. In the comics, the prisoners of the Soul Stone are brought back using the Infinity Stones, given new bodies and are able to live out the rest of their lives in the ‘real world’. The Theory: Ant-Man (and possibly others) will travel back in time to do something that will save the world. What it means: While time travel is one of the strongest theories, how Ant-Man will time travel is still in question. The manipulation of time has been brought up twice in the MCU so far. The Time Stone would seem like the most logical option, but the green infinity stone is currently in Thanos’ possession. That being said, the Time Stone is untethered in time, meaning the stone can turn up anywhere in the past or future where Ant-Man or anyone else could get their hands on it. The bigger problem with this solution is that the only person who can wield the Time Stone is Doctor Strange who is a victim of the snap. The other mention of time travel is in the post-credits scene of Ant-Man and the Wasp. Jane van Dayne who has spent a considerable amount of her life in the Quantum Realm warns Ant-Man about time vortexes before Scott Lang goes into the Quantum Realm. She says, "Don't get sucked into a time vortex, we won't be able to save you.” At the end of Ant-Man and the Wasp Hope, Hank, and Jane get dusted leaving Ant-Man stuck in the Quantum Realm without a way back up to the surface. In order to return to the real world perhaps Ant-Man goes through a time vortex in order to avoid being trapped in the Quantum Realm. After all, the stinger at the end first Avengers: Endgame is Scott Lang arriving at Avengers Headquarters asking to be let in, so we know he escapes the Quantum Realm somehow. Why it could work: While this theory is a bit vague, it is the one with the most evidence to back it up. It’s a safe bet that time travel will at least be a part of the new Avengers movie. 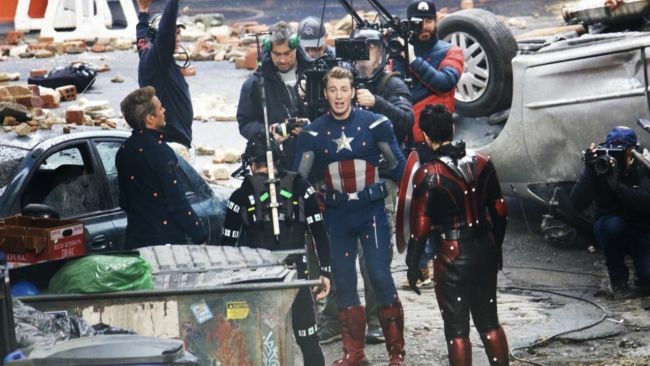 Set photos long before Avengers: Infinity War came out showed Captain America and Iron Man wearing their superhero uniforms they wore during the first avengers. If you look even closer Captain America has the same hair, the same joyful expression - almost as if half the world isn’t dead! Add to that the background and you’ve got a fairly compelling argument for this scene being from the Battle of New York in The Avengers. However, Ant-Man is with them. The inclusion of Ant-Man suggests that the scene is not merely a flashback or dreamlike coma because Ant-Man was never in The Avengers. Captain America and Iron Man aren’t the only ones who have been seen in old costumes. Thor has been seen on set wearing his original Avengers look with Loki wearing a muzzle and supposedly holding the Tesseract. Zoe Saldana posted a behind-the-scenes look, which shows Gamora wearing her original Guardians of the Galaxy costume and Evangeline Lilly did the same but showed off Hope’s old hairdo, which we know she doesn’t have anymore. The Russo Brothers have said on multiple occasions that Loki is truly dead but set photos of Tom Hiddleston show Loki alive and well, but as Loki in the first Avengers movie. Either the Russo Brothers are lying about Loki being truly dead, or Loki is actually dead and time travel is involved. The reappearance of other dead characters like Hope and Gamora seem to suggest that time travel will certainly be dabbled with in Avengers: Endgame. While these scenes and outfits could all be part of flashbacks filmed for Avengers 4, it’s Ant-Man’s appearance in the images above which seem to confirm the time travel theory. The Theory: The Quantum Realm is somehow involved in the defeat of Thanos. What it means: The Quantum Realm has been hinted at across MCU movies such as Doctor Strange, Ant-Man, Ant-Man and the Wasp, and Captain Marvel. Superheroes can travel within the realm where time vortexes exist. Somehow a group of superheroes--most likely Ant-Man and others--will travel within the Quantum Realm to avenge the universe. Aside from the Quantum Realm time vortexes and infusing the quantum realm in someone, the Quantum Realm could have ties to Captain Marvel. It is unclear where MCU’s Captain Marvel gets her powers, however, Captain Marvel is at least one of the keys to defeating Thanos. According to the Russo Brothers and Kevin Feige, Captain Marvel is the strongest character in the MCU, and seeing her superhero origin film (set to be released only one month before Avengers: Endgame) is a key part to understanding Avengers: Endgame. The end credit scene of Avengers: Infinity War shows Nick Fury paging Captain Marvel. It has been theorized that the reason why Captain Marvel hasn’t helped out the Avengers before is that Captain Marvel is Nick Fury’s secret weapon. If Captain Marvel is more powerful than Thanos, it makes sense that Fury would save her for a rainy day strategically choosing not to show off all his assets at a time. Additionally, the two Captain Marvel trailers seem to hint that some sort of quantum explosion is the way she gets her powers. The trailers show Captain Marvel getting flung back by a blue energy and when she rises the blue energy is within her. The explosion itself has the same makeup as quantum realm explosions. Leaked Avengers: Endgame toy sets show characters in “quantum realm” suits, suggesting that the Quantum Realm at least plays some part in the plot of Avengers: Endgame. 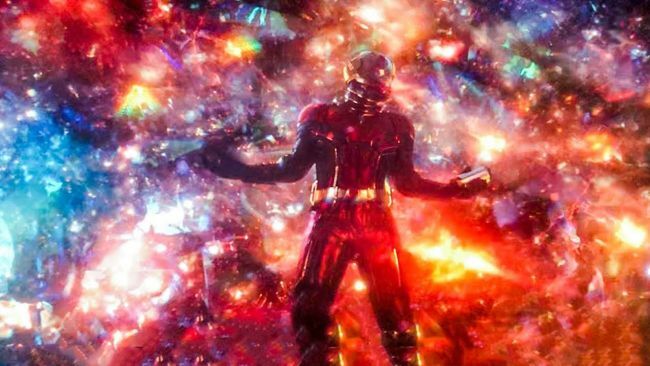 Why it could work: While this theory isn’t exactly fully formed and mainly ties into many other theories, the quantum realm is something Marvel will most likely explore in later films, if not in Avengers: Endgame. The Quantum Realm in the MCU is described as “a reality where all concepts of time and space cease to exist.” Since the snap happened while Scott Lang was in a dimension where time and space ceased to exist, then this is perhaps how Scott Lang survived the snap. The Quantum Realm has time vortexes which tie into the time travel theory. The anti-hero of Ant-Man and the Wasp gained her phasing powers from the Quantum Realm, and Janet van Dayne seems to have special healing powers gained from her time there. Ava Starr’s power is that she is virtually untouchable, like a ghost able to move through solid objects. Interestingly, she gained her power from a Quantum Realm explosion and thus has parts of the Quantum Realm inside her. Given that the Quantum Realm seemed to save Scott Lang from the effects of the Infinity Stones, it could be theorized that the Quantum Realm is “immune” from the power of the Infinity Stones. Having the Quantum Realm inside you is a pretty powerful advantage against Thanos, as the only power that sets him apart from a strong purple giant is his possession of the Infinity Stones. With new trailers, marketing, and promotional photos sure to come in the near future, theories for how the Avengers will defeat Thanos in Avengers: Endgame are ever-evolving. However, until the next trailer or new information about Avengers: Endgame comes, these three theories make the most sense. Until the next game-changing trailer, we Marvel fans will be stuck combing over every frame of the first Avengers: Endgame trailer.